Disease-free survival is short-lived for women with triple-negative breast cancer—a form of the disease that doesn't respond to hormone drugs and becomes resistant to chemotherapy. Thankfully, a promising line of study in the School of Medicine at The University of Texas Health Science Center San Antonio suggests it is possible to fine-tune the properties of this fearsome cancer, making it more sensitive to treatment. Once preclinical studies have been completed in coming months, this new approach should be ready to test in female patients, a scientist said. The research focuses on molecules called microRNAs that occur naturally throughout the body. These molecules play an important role during development and in disease processes. "Some microRNAs suppress cancer while others promote it," said Behyar Zoghi, M.D., Ph.D., hematology-medical oncology fellow in the School of Medicine and first author of a study presented at the recent American Society of Clinical Oncology (ASCO) meeting in San Francisco. 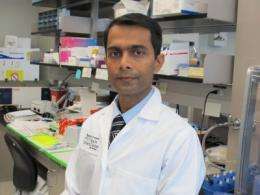 "We identified microRNAs that can uniquely sensitize drug-resistant, triple-negative breast cancer to chemotherapy drugs such as paclitaxel," said senior author Manjeet Rao, Ph.D., assistant professor of cellular and structural biology and a principal investigator at the Greehey Children's Cancer Research Institute of the UT Health Science Center. The institute's researchers pursue novel understandings about biology that will apply to both pediatric and adult cancers. In preclinical studies, the team injected microRNA into mice with established tumors. "The microRNA not only killed the cancer and didn't let it come back, but was also safe based on toxicity studies of the liver and other tissues," Dr. Rao said. The microRNA, delivered along with chemo, conditions the tumor so that it responds to a much lower dose of the drug and many side effects are prevented. "MicroRNAs are very stable and small in size, so theoretically we don't need a very complex delivery vehicle," Dr. Rao said. "Importantly, the microRNAs that we studied can be very good prognostic markers, as they are detected in blood serum and expressed at significantly different levels in patients when compared with healthy individuals." He expects the preclinical work to soon be translated to a first-in-humans Phase I clinical trial at the Cancer Therapy & Research Center (CTRC) at the UT Health Science Center San Antonio. The CTRC is one of four National Cancer Institute-designated Cancer Centers in Texas.